This island country spanning 10 volcanic islands in the central Atlantic Ocean is a beautiful place, which was surprisingly uninhabited till the 15th century. These tiny islands may be difficult to spot on the map but each of them serves a different set of attractions and are thus popular tourist destinations. Whether it is golden sandy beaches that you desire or loud and vibrant nightlife, this place gives you everything. This is a westernized nation that still has the African element to it and also has traces of the Portuguese era. Fogo Island is the most iconic of all and has a maximum altitude of 2900 meters and you can trek the entire Pico de Fogo volcano from Cha de Calderias town. The Sao Filipe town is the home to the island’s airport and relaxing at the beaches here is a treat. 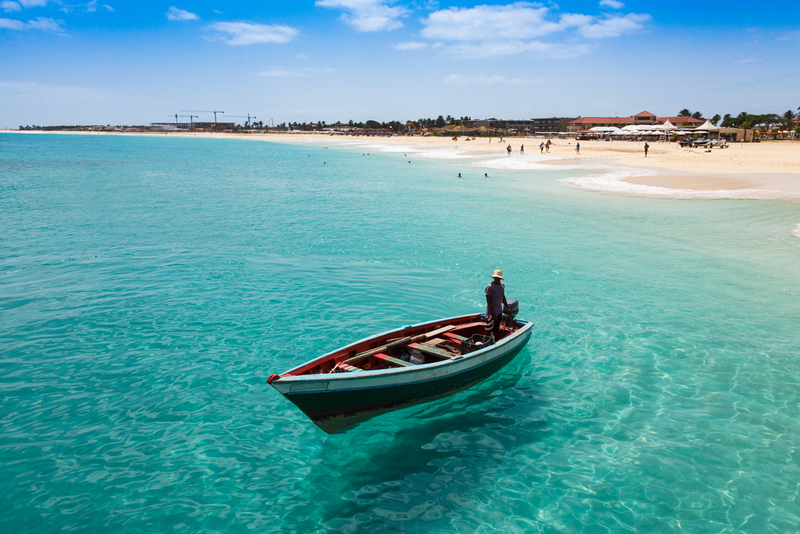 The island of Sal is the place to be for those seeking a tropical paradise and it offers long beaches like Praia de Santa Maria to unwind and soak in the warm sunlight. It is also a nesting site for Caretta Caretta Loggerhead turtles and witnessing this great event of the turtle laying eggs is a unique experience. Lively bars and restaurants await your arrival in the city of Palmeira, which is also a popular hiking and diving site, where you can explore underwater caves and reefs just off the coastline. The capital, Praia, is the largest city and is the place to head to for exploring the old colonial buildings in the city’s old town. The marvelous presidential palace built in the 19th century features neo-Greco architecture and the old churches in the city are worth visiting as well. Exploring the plaza in the center of Sal Rei, the capital of the easternmost island of Cape Verde, is a truly African experience with goods being sold by traders in midst of colorful flowers and buildings. Riberia Grande is a city on the Santo Antao Island and is located in the valley of the same name. The winding streets of the city with the backdrop of the lush green mountains is quite a sight and sitting and relaxing in the hot springs in the city is the best way to unwind. Visiting the royal palace of Santo Antao is one of the best ways to experience and learn about how the royalty lived here. Swimming in the water surrounding the Tarrafal Island or relaxing on the black sandy beaches here is a unique experience, as the sands are said to relieve pain due to minerals present in them. With almost every island here having an airport, traveling between them is an experience in itself where you can feast on the beautiful views of the islands in the Atlantic Ocean from the air. Yachts can be found on practically every island here and seeing the islands from the sea gives a different feel altogether and is the perfect place to click some beautiful snaps! These scenic drops in the ocean are the perfect place to head to for a relaxed getaway from our busy lives and simply enjoy the beauty of nature.